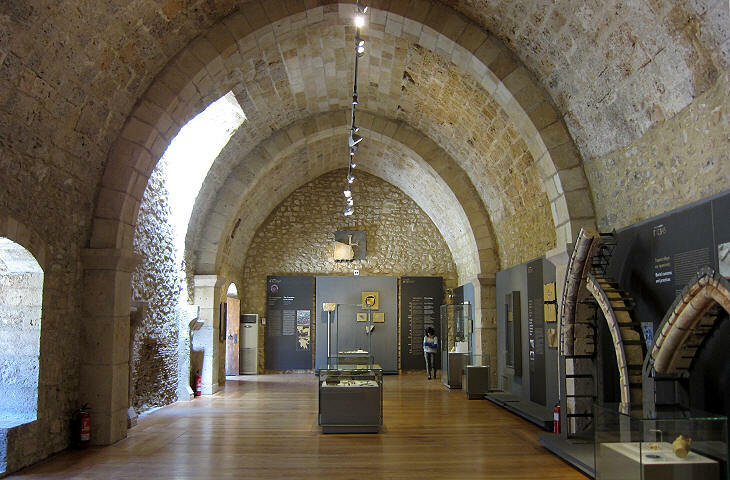 Castel Tornese, in French Clermont was built by Geoffrey I of Villehardouin, Prince of Achaea on a site which had not been fortified previously; the choice was motivated by political and military reasons. 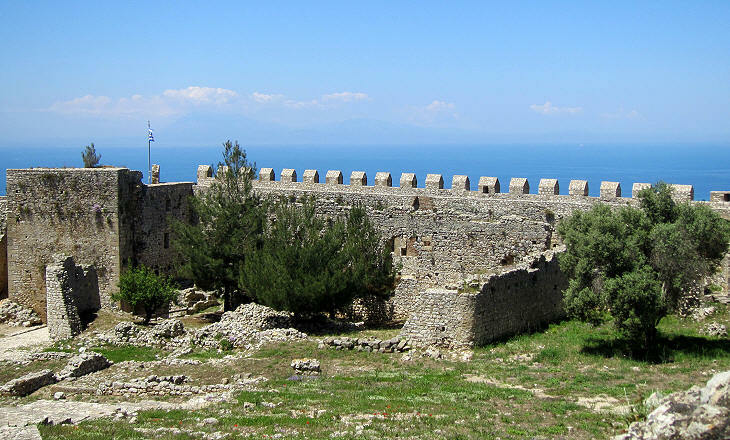 The castle stood on a hill at the westernmost point of Peloponnese; it was very visible from the sea and thus to ships on their route to the Levant; it was a sort of symbol of the newly founded state. Geoffrey was a French knight who joined the Fourth Crusade. Rather than freeing Jerusalem the crusaders ended up by conquering Constantinople in 1204. They partitioned among them several territories of the Byzantine Empire. Geoffrey was involved in the conquest of Morea (Peloponnese) which was completed in a few years and in 1209 he was appointed ruler of the new state which was called the Principality of Achaea. 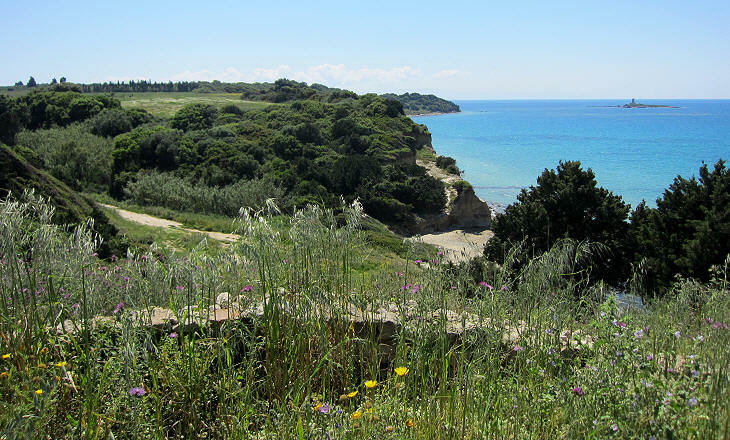 Achaea is a region of northern Peloponnese having Patras as main centre, but the word had a wider meaning because Homer used Achaeans as a generic term for Greeks in The Iliad. The Principality of Achaea included the whole Peloponnese (aka Morea) with the exception of: a) Nauplia and Argos which were assigned to Othon de la Roche for his contribution to defeating the Byzantines; b) the Venetian fortresses of Methoni and Koroni; c) Monemvasia, the last Byzantine stronghold in the Peloponnese. 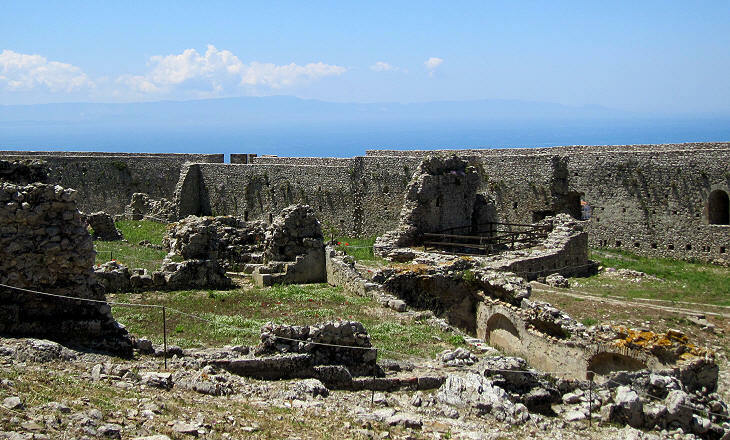 From a military viewpoint the construction of Castel Tornese shows that Geoffrey feared a possible attack from southern Italy, which at the time was ruled by Frederick II, Holy Roman Emperor, or from the Orsini, a branch of the famous Roman family, who controlled Zante and Cefalonia. Geoffrey had probably in mind to build an imposing fortress, similar to those built by the crusaders in Syria, but he lacked the financial means to do this. 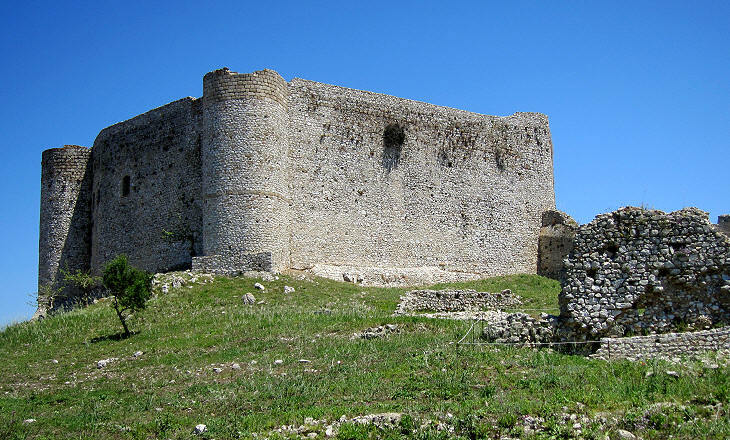 As a matter of fact Castel Tornese is not associated with any important siege; it was surrendered by its occupants as a consequence of military or political events which occurred elsewhere. 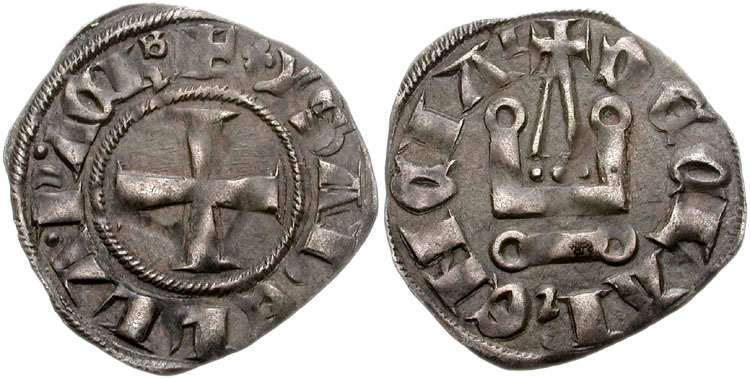 The Italian name makes reference to livre tournois, a coin minted in the castle and similar to the coinage of Tours in France, which during the XIIIth century became the unit of account of France. The Achaean mint was authorized by King Louis IX of France. The coins were actually minted at Glarenza, a port near the castle; they were not much praised; they were issued as silver coins, but the percentage of the precious metal was very low and numismatics regard them as billon coins (billon is an alloy containing silver with a predominating amount of copper). You may wish to see a coin minted at the time of Isabelle de Villehardouin - it opens in a separate window. The castle was made up of a roughly triangular outer enclosure which was modified by the Ottomans and of an inner castle having the shape of an irregular hexagon; the latter was strengthened by two towers, which were meant to protect it in case the enemy had managed to enter the outer enclosure. 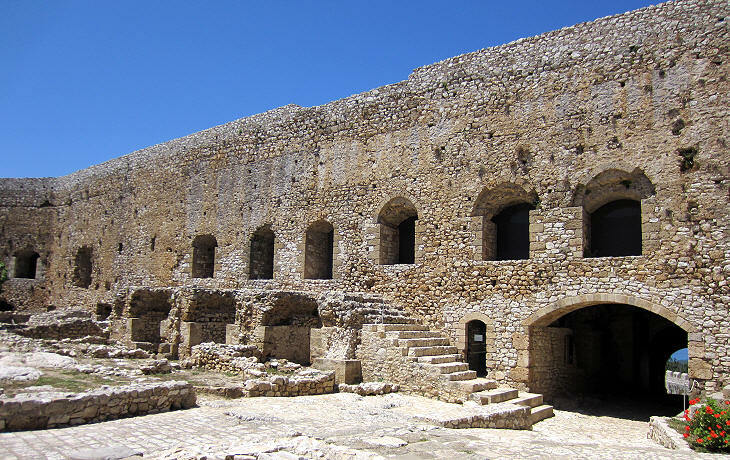 In 1825 the fleet of Ibrahim Pacha bombarded the castle, as it had been occupied by the Greeks during the war which eventually led to the independence of Greece. The castle was not only a military building. Its large halls could house the court of the Princes of Achaea, whose possessions during the XIIIth century shrank to almost only Elis, the western part of Peloponnese which included ancient Olympia. 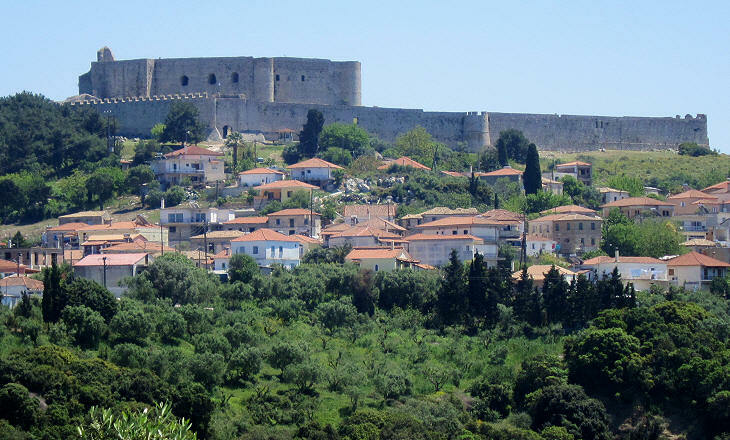 Initially the Villehardouins set their court near ancient Sparta, but when the Byzantines conquered the south-eastern part of Peloponnese, they usually lived at Andravida (then Andreville), a few miles from Castel Tornese. In 1266 Charles of Anjou, brother of King Louis IX of France conquered southern Italy and Sicily. William II of Villehardouin, whose possessions were threatened by the Byzantines sought the help of Charles. In 1267 at Viterbo the two signed an alliance which was strengthened by the marriage in 1271 of Philip of Anjou, son of Charles, with Isabelle de Villehardouin, daughter of William. A clause of the marriage agreement established that if the couple had no heirs, the Principality of Achaea would be inherited by Charles at the death of William. Because Philip died before his father without offspring in 1278 the Principality passed to Charles; he was planning to wage war on the Byzantines, when in 1282 a revolt in Sicily turned him away from his expansion plans. The Principality of Achaea became a neglected fiefdom of the Angevin kings of Naples who ruled the country through vicars. The Principality of Achaea came to an end between 1429 and 1432 when it was incorporated into the Despotate of Mistra. The Byzantines were able to enlarge their possessions in the Peloponnese, but the Byzantine Emperor at Constantinople was faced with an ever growing Ottoman threat. In 1453 Sultan Mehmet II seized the city and in the following years he turned his attention to the Despotate of Mistra which the Ottomans conquered in 1460. 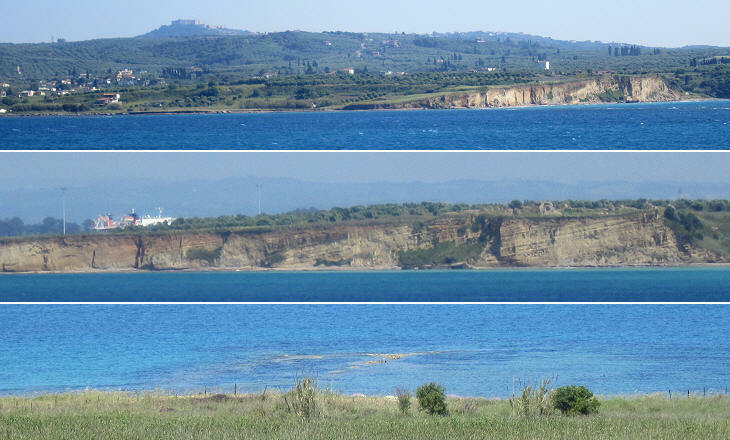 Due to the strict links between the Principality of Achaea and southern Italy, Prince William II decided to found Glarenza (or Glarentza or Clarence), a new port very close to Castel Tornese. Glarenza soon became an important town, where the princes often resided. 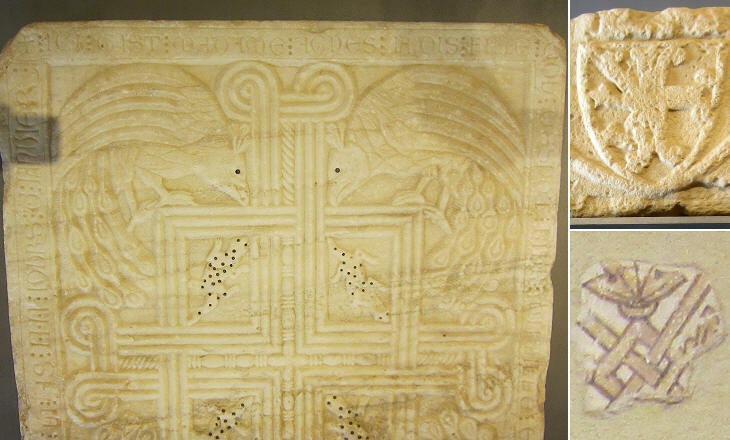 The Byzantines and later on the Ottomans were not interested in maintaining a port which could be used by the Venetians or the Neapolitans as a bridgehead for invading the country; the walls were pulled down and eventually the port was abandoned. The remaining ruins of Glarenza were demolished by German troops during WWII. 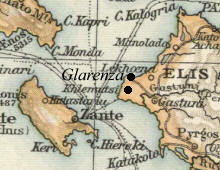 Old Venetian maps indicate a small harbour immediately to the east of Glarenza with the name of Climinò; today it is known as Kyllini and it is the terminal of the ferries for Zante and Cefalonia. 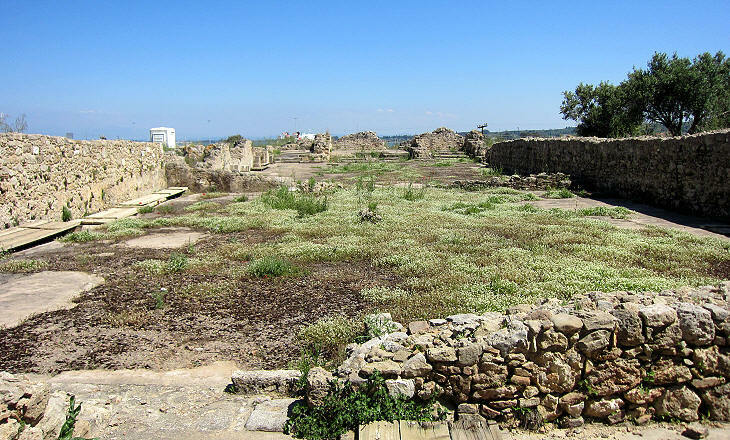 Archaeologists have excavated the hill behind Kyllini and they have found evidence of the walls and main buildings of Glarenza, including a Gothic cathedral dedicated to St. Francis of Assisi. Some sources indicate that Glarenza gave its name to one of the titles of the English Royal Family (Duke of Clarence). It was first assigned to Lionel, the second son surviving infancy of King Edward III of England and Philippa of Hainault. Isabelle de Villehardouin, after the death of her first husband, Philip of Anjou, married Florent of Hainault; the couple ruled over the Principality of Achaea on behalf of the Angevins; after the death of her second husband and a third marriage, Isabella retired to Hainault (today a region of Belgium). Her only daughter Matilda of Hainault claimed to be entitled to the Principality and it is possible that the Hainault family maintained their rights to Achaea after her death in 1331. King Edward on behalf of his wife, Philippa of Hainault, claimed rights on Hainault and other inheritances and this could have led him to appoint Lionel Duke of Clarence in 1362. The official version of the origin of the title indicates that the name derives from Clare, a small town in Suffolk. The reference to Clare does not seem to be as important as those included in the titles given to the younger brothers of Lionel (York/Lancaster), while the reference to Glarenza/Clarence had the charm of a faraway location. 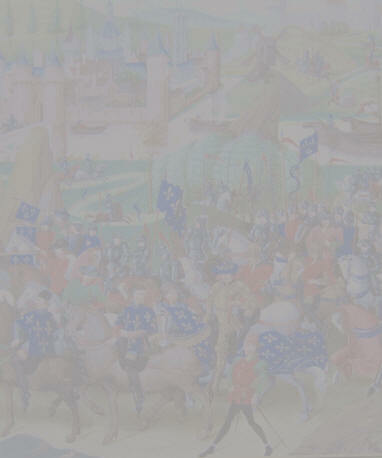 The title was granted again in 1412 and in 1461 to younger sons of the ruling kings. It was resurrected in 1789 for Prince William, third son of King George III; at that time the memory of Glarenza/Clarence was probably lost. The image in the background of this page is based on a medieval miniature showing French knights coming out of a castle. Alle sponde destre del Fiume Igliaco chiamato da Tolomeo Penoeus Fluvius, erta sopra colle vicino alle spiaggie del Golfo di Patrasso giace Chiarenza, creduta l'antica Cyllene, Patria di Mercurio. Cyllenius Heros per tal cagione detto. Questa fu principale della Ducea de medemo nome, quale sotto il governo de natii Principi, come portava i chiarori nel nome, così era più ch'illustre al Mondo: i Veneti con giusto carattere la possederno, e ove in que tempi s'attrovava ben condizionata, vedesi al giorno d'hoggi si sprovista, che di suo le Fosse solo, e vestigie appaiono; il porto pure che di Chiarenza appellavasi, poco gl'era discosto; e se un tempo fù di molto capace, non riceve al presente, che sabbia, della qual'è ripieno. 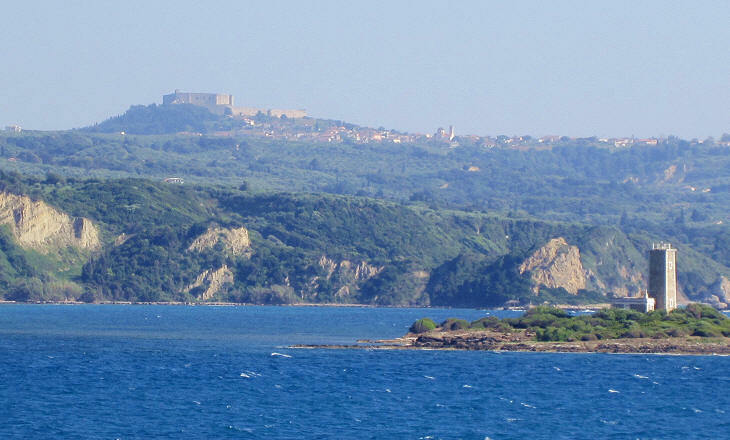 Giace Castello Tornese sopra l'ultimo Promontorio del Ducato di Chiarenza, in quella parte che riguarda la Provincia di Belvedere trà il Golfo di Chiarenza e quello dell'Arcadia, chiamato al riporto di Baudrand Chelonates dal nome con che Strabone appella il di lui Promontorio, nomato altrimenti dalli Turchi Clemoutzi, posto in eminente sito, tre miglia incirca lungi dalle sponde del Mare.